Getting married means becoming partners in life, but for Peter and Holly Ranney, their union has helped improve the lives of more than forty families. With Holley's background in marketing and design and Peter's construction expertise, the couple have made it their life's work to renovate homes for children with special needs through their non-profit Sunshine on a Ranney Day. Making changes such as wheelchair accessible bathrooms, creating in-home therapy rooms, and turning a basement into a dance studio for a girl fighting cancer, Sunshine on a Ranney Day provides these services free of charge, allowing parents to focus on what's really important: taking care of their child. Read on for more from this amazing non-profit and the lengths they will go to answer the dreams and needs of these families. One of the most recent projects of Sunshine on a Ranney Day was to turn the sleep rooms in the Children’s Healthcare of Atlanta hospital into a more comfortable place for parents and family members whose children need extended hospital stays. The parents want to be close to their children, yet the sleeping arrangements pre-renovation were less than luxe, displaying sterotypically sterile and stark places for parents to lay their weary heads. After Sunshine on a Ranney Day’s makeover, the sleep rooms resemble a fancy hotel or spa with a cozy, chic vibe. The hospital sleep room renovation will benefit hundreds of families, but Sunshine on a Ranney Day’s specialty is clearly the projects they do for individual families. Uniquely responding to each child’s specific needs as well as their personal styles, the Ranneys and their team, which includes numerous volunteers, partner with local companies and donors to create custom efforts that are truly heartwarming to witness. The costs for these projects could run up to $35,000 per room, but the families don’t have to pay a dime. 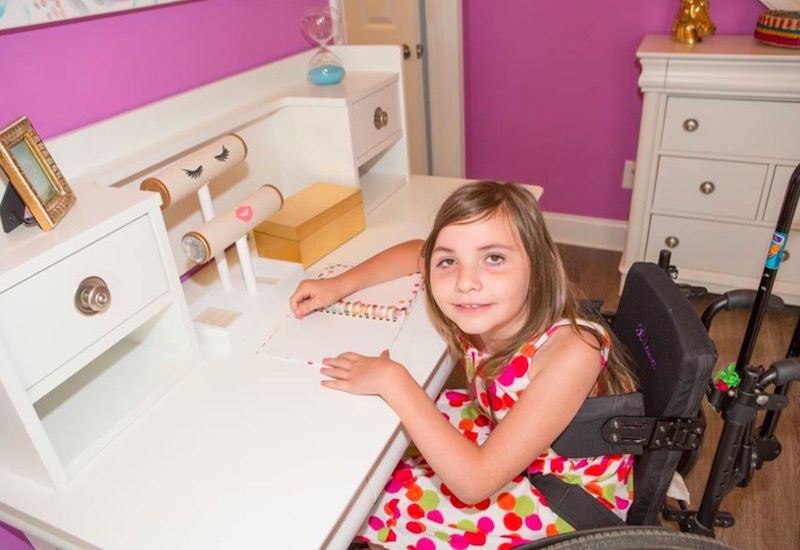 Sunshine on a Ranney Day focuses their efforts on areas of the home including bathrooms, bedrooms, hallways, therapy rooms, and wheelchair ramps. These are all spaces that are frequently used and need to be accessible in order for the children to comfortably transition to life at home. For many of these families, adjusting to having a child in a wheelchair can feel overwhelming, so Sunshine on a Ranney Day manages some of the nuts and bolts so that parents can focus on their children’s mental, emotional, and physical wellness. From a brightly colored bedroom makeover featuring superhero paraphernalia galore for a young cancer patient to a lovely lavender abode for a girl with a rare neurological and development disorder, Sunshine on a Ranney Day creates thematic, carefully curated spaces that put the “fun” in functional. They never lose sight of the fact that they are renovating these rooms with the children in mind, so every room becomes an extension of the particular child’s needs and interests. Seeing the reactions on the children’s faces through the room reveals seems to motivate and energize the Ranneys and their team; each project glimmers and shines with the heart and love that emanate from this inspirational couple and the families that they serve. One of the most recent projects of Sunshine on a Ranney Day was to turn the sleep rooms in the Children's Healthcare of Atlanta hospital into a more comfortable place for parents and family members whose children need extended hospital stays. The parents want to be close to their children, yet the sleeping arrangements pre-renovation were less than luxe, displaying sterotypically sterile and stark places for parents to lay their weary heads. After Sunshine on a Ranney Day's makeover, the sleep rooms resemble a fancy hotel or spa with a cozy, chic vibe. The hospital sleep room renovation will benefit hundreds of families, but Sunshine on a Ranney Day's specialty is clearly the projects they do for individual families. Uniquely responding to each child's specific needs as well as their personal styles, the Ranneys and their team, which includes numerous volunteers, partner with local companies and donors to create custom efforts that are truly heartwarming to witness. The costs for these projects could run up to $35,000 per room, but the families don't have to pay a dime. Sunshine on a Ranney Day focuses their efforts on areas of the home including bathrooms, bedrooms, hallways, therapy rooms, and wheelchair ramps. These are all spaces that are frequently used and need to be accessible in order for the children to comfortably transition to life at home. For many of these families, adjusting to having a child in a wheelchair can feel overwhelming, so Sunshine on a Ranney Day manages some of the nuts and bolts so that parents can focus on their children's mental, emotional, and physical wellness. From a brightly colored bedroom makeover featuring superhero paraphernalia galore for a young cancer patient to a lovely lavender abode for a girl with a rare neurological and development disorder, Sunshine on a Ranney Day creates thematic, carefully curated spaces that put the "fun" in functional. They never lose sight of the fact that they are renovating these rooms with the children in mind, so every room becomes an extension of the particular child's needs and interests. Seeing the reactions on the children's faces through the room reveals seems to motivate and energize the Ranneys and their team; each project glimmers and shines with the heart and love that emanate from this inspirational couple and the families that they serve. Kalen is a happy recipient of a room makeover.